Salads have a long time reputation for being healthful and satisfying. 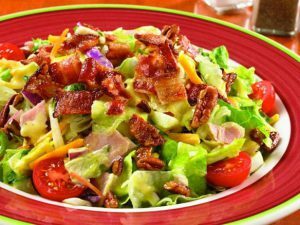 Many times people load their salads with various ingredients that result in a meal over 1,000 calories and 80 grams of fat. There are lots of fixings that can actually sabotage that healthy meal. Some of these additions may even be healthful foods, so it’s key to watch portion sizes, something most people tend to underestimate. Adding too much cheese! Without measuring the amount of shredded cheese you’re adding, you may wind up using way too much. Include cheese if you want, but make sure not to go over 1/4 cup. Piling on the olives! Olives are heart-healthy and part of the Mediterranean diet, but they are caloric. Twelve olives can be an additional 100 calories, so keep it to 6 olives. Including too many high protein foods like grilled chicken, beans and hard-boiled eggs in the same salad. All three of these are excellent sources of protein and really help turn a salad into a satisfying meal, just limit to one or possibly two per salad depending on what else you’re including. Not taking into consideration the amount of nuts and seeds you’re throwing into the salad. Although nuts and seeds are healthful plant-based nutrient-dense foods, the calories and fat add up quickly. 4 tbsp of sunflower seeds and 4 tbsp of almond slices together provide 400 calories. Opt for one add-in from this category and use only 2 tbsp. Adding lots of dried fruit like craisins. Instead add 1/2 cup of fresh fruit like strawberries, blueberries or mango. Salad dressing may be the number one source of hidden calories and fat in your salad. Just 2 tbsp of 1000 Island dressing is 120 calories and 11 gm of fat. A vinegar-based dressing is generally a better option, but the main problem with salad dressing is the amount. Most people use 4x that amount! The best hack is to keep 2 tbsp of dressing on the side and dip your fork into it before each bite. You’ll be surprised how a tiny bit of flavor can go such a long way and you may even have some leftover at the end! 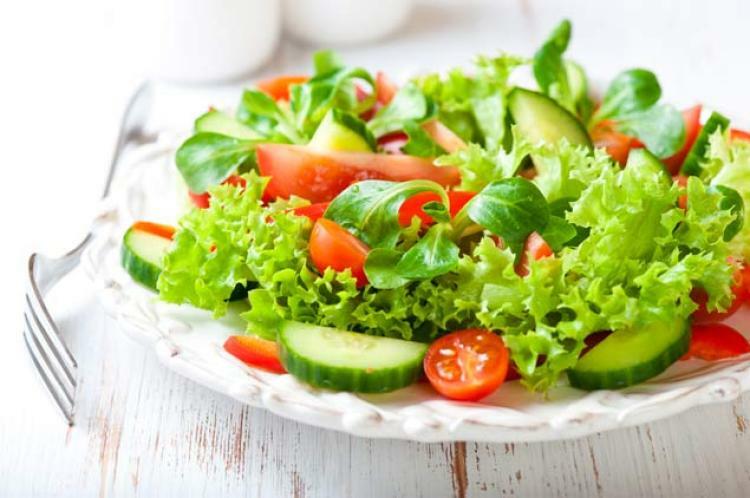 A salad done right can be a very healthful meal when you follow a few simple steps! Salads can be a terrific go-to to help promote weight loss and provide a healthful, satisfying meal. Including protein and fiber is a great way to keep you feeling satisfied and energized. Start with a base of 2 cups of greens then pile on a bunch of healthy veggies like tomatoes, bell peppers, mushrooms and carrots. It’s always fun to experiment, so try different taste combinations! Do you make any salads that would blow us away? Please share!